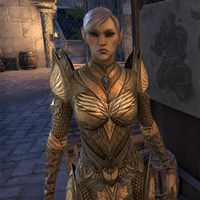 Justiciar Farowel is an Altmer member of the Divine Prosecution under Chief Justiciar Carawen who, issues contracts to deputized visitors from the Divine Prosecution station located in Rinmawen's Plaza in Alinor alongside Justiciar Tanorian. She issues contracts that involve world bosses. while Justiciar Tanorian sends you to delves. The Abyssal Alchemist: Clear out Welenkin Cove and eliminate the Sea Sload B'Korgen. Birds of a Feather: Defeat Haeliata and Nagravia and collect their feathers. Never Forgotten: Defeat Graveld and collect four Scrolls of Oath. Run Aground: Kill Keelsplitter and recover intelligence logs. The Sickening Sea: Collect coral crab eggs and defeat the Queen of the Reef. Taming the Wild: Kill Caanerin and restrain her spirit. "As a justiciar of the Divine Prosecution, I request your aid, newcomer. Dangerous entities have appeared throughout Summerset and, as much as it galls me to admit it, we could use the help of skilled adventurers. "My respect is only for those who have truly proven themselves devoted to the Divine Prosecution's mission. But I must admit, you're showing promise." "I must admit, the newcomers who we've contracted have been pulling their weight. Surprising, to say the least." "As a current resident of Summerset, you must do your part to protect our beloved island. Do you have time to take on another assignment?" "As a duly sworn deputy of the Divine Prosecution, your aid is required newcomer. Dangerous entities have appeared throughout Summerset and we could use the help of skilled adventurers such as yourself. "Summerset remains threatened and the Divine Prosecution needs assistance. Will you once again offer yours?" "The safety of Summerset remains our highest priority. Make haste and complete the assignment we gave you." "The Divine Prosecution has granted you the honor of helping us during these dark times. See that your duty is done." "You have an assignment, newcomer. Attend to it at once." "You seem quite dedicated to your tasks. At least you're good for something, newcomer." You seem somewhat reluctant to accept the help of a newcomer. "Reluctant? Perhaps. But I'm also a realist. I'll accept help wherever I can find it if it means the survival of Summerset. Besides, it's not like I have a lot of other options in this matter." Can't you deputize the native High Elves? "Your flaws are showing, newcomer. Don't you know the Altmer of Summerset each have a purpose and a function? I can no sooner ask a farmer to abandon his field as I can alter the course of a flowing river. But you're willing to ask a newcomer for help? "To be frank, at this point I'll take what I can get. As a justiciar of the Divine Prosecution, my orders are clear. Do whatever it takes to make sure these contracts get completed. I never shirk my duty, and neither should you." "Justiciar is my rank in the Divine Prosecution. It means I have more authority and responsibility than a bailiff, but not as much as a chief justiciar or a magistrate. I tent to investigate criminal infractions and adjudicate legal disputes." "Newcomers often erroneously reach that conclusion. It defines an aspect of my role, but not the entirety. Justiciars not only render judgment, but also embody the righteousness of law. Pity I'm forced to work with newcomers, though." "The Sea Sload B'Korgen has turned the Welenkin Cove west of Alinor into a lair of sorts. My scouts report that the vile Sload uses alchemy to empower the other members of the Abyssal Cabal and transform yaghra into even more fearsome creatures." "I need you to destroy the tainted coral that serves as the primary ingredient for B'Korgen's alchemical concoctions. Then eliminate the Sload alchemist before he can unleash more terrors upon the island. I suggest you take companions on this one." I'll deal with B'Korgen and destroy the patches of tainted coral. "Our appointed agent returns. Your report, quickly! Was your hunt successful?" I killed B'Korgen and destroyed the corrupted coral. "Every victory against the Abyssal Cabal is a triumph for Summerset. The Divine Prosecution acknowledges the completion of this contract. Here is your reward. I'll send scouts to the cove to deal with any tainted coral that remains." "The problem is I have the ignominious duty of offering up the redemption of this office's honor to any interested party. All because we're playing minder to newcomers in record numbers. What I'm trying to say is I require help to honor our fallen." "Investigators on their way to Sil-Var-Woad's Royal Menagerie were killed by an escaped beast. I don't know what those zoo keepers are doing, but Graveld is running amok in the wilderness. Kill it and retrieve the Scrolls of Oath from our Justiciars." I have some questions about my assignment. "This day is testing my patience, newcomer. I suggest you make your inquiries quick." What is this creature, Graveld, that I'm hunting? "A giant salamander. The largest ever recorded. It was at the Royal Menagerie for public display, but that doesn't appear to be the case any longer. It killed a well trained team of Justiciars. I don't suggest you hunt it alone." Why do you want these Scrolls of Oath? "Officers of the Divine Prosecution take our oaths knowing that we might be asked to lay down our lives in the pursuit of justice and righteousness. These scrolls act as our mandate, our authority, and our identity... to be memorialized when we fall." "An animal sanctuary and display of curiosities. The keepers care for creatures from all over Summerset and Tamriel. Clearly not well enough, if they let a dangerous beast escape to wreak havoc." "Ha! Have I a few dozen warships lying about? We've lost an embarrassing number of vessels in the last few months. Foul weather claimed most of them, but those Maormer= de'nts have certainly done their part. It's their pet, you see? Keelsplitter." "Yes. A massive sea adder. It suns itself in the bay south of Sea Keep. Our navy won't be safe until it's dealt with. Worse, the ships it destroyed carried sensitive intelligence. I need you to search the short and recover any logs you can." All right. I'll slay Keelsplitter and recover your intelligence. What do you know about this Keelsplitter? "Beyond the fact that it's a massive, winged sea monster that devours sailors by the dozens? Precious little. Keelsplitter is dead. Here are the ships' logs you requested. "And you managed to keep all your limbs intact. Commendable. The Office of Divine Prosecution thanks you for your labors. Mark me - our navy will return to its former strength soon, and these Sea Elves will pay a heavy price for what they've done." "Then you distinguish yourself from many of the newcomers I see. Your duty today will be to investigate the unholy perversion of our beloved isles. There are unsettling rumors that the curse of Corgrad is spreading. The Sapiarchs desire evidence." "Coral crab eggs, from the reef between Corgrad and Lillandril. Handle them carefully, and beware the Queen of the Reef. That giant coral crab has killed many an ambitious gourmand, but if she has been perverted by unholy powers she must be purged." I had some questions about my assignment. "A justiciar is expected to produce answers, not harbor questions, but I suppose you are no justiciar. What is this curse of Corgrad the Sapiarchs are concerned about?. "Corgrad was a city that was utterly devastated during the time of the Thrassian Plague. The scale of death and corruption there has left the place forever marred. If this long festering wound is now spreading, action must be taken.."
Any advice on how I should deal with the Queen of the Reef? "It is not normally part of the Divine Prosecution's purview to render judgment onto crabs. My only advice would be -and I'm ashamed to have even to say this- do not eat anything tainted with impurity." What do crab eggs have to do with a spreading curse? "The taint of Corgrad was swallowed by the sea very long ago. If that taint is spreading, it will affect the sea life first. The Sapiarchs must believe that the health of the eggs will be a good indicator of blight, and that is good enough for me." "My time is short, so let's keep this brief. Have you completed the task I placed before you?" I've done as you asked. "So you have. These samples bear a lingering, necromantic taint, but from what will be up to the Sapiarchs to determine. Your adequacy will be noted in the record. Here is your reward." "Caanerin, the indrik matriarch, has returned to her ancestral glade near the center of the Isle. The last time this happened, she fawned a whole herd of lesser indrik and destroyed half of Russafeld. Obviously, that will not do." So you need someone to kill Caanerin? "Yes. Ancient indriks like Caanerin enjoy a deep connection to Y'ffre—the forest god. They are very resilient—much like weeds. Luckily, the Sapiarchs erected warding stones to keep her from returning. Kill Caanerin and activate those stones." All right. I'll defeat Caanerin and activate the warding stones. "Can I assume that your presence indicates a successful completion of your assignment? I eagerly await your report." "Good. Let's hope those warding stones hold. I would hate to see a beast like that return. In any event, this will bring the people of Russafeld some comfort. You continue to defy expectations, newcomer. Well done." This page was last modified on 1 March 2019, at 00:24.